I use Creative Commons licenses on some of my work. It is part of my idea of being able to share some of my music and build relationships with other music lovers. They are a non-profit, which means, like your public radio station etc., that every once in a while they come asking for money to keep things running. Now is that time. They are pretty close to making their Dec 31 fundraising deadline. If you would like to help them out, or just find out more, click the button above. 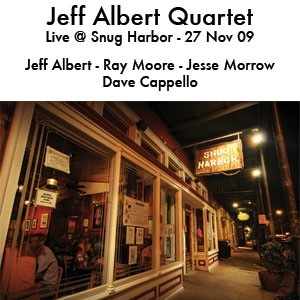 Over at jeffalbert.com, I just posted all of the music (and much of the witty banter) from the quartet’s midnight set at Snug Harbor, in New Orleans, on November 27th 2009. Here is link to the zip file that has everything, or you can go to that page and stream tracks individually. PJ (I’ll use his initials so I don’t find myself on one of his lists) over at A Blog Supreme has posted his list of lists. They are all good. My fave is below, but I must stick up a little for my trombone playing brother. It’s not our fault we make lots of condensation, and yes it is more condensation than spit. 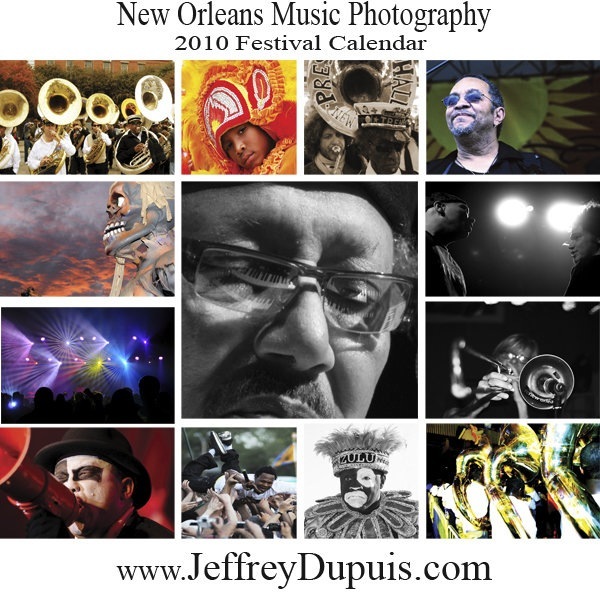 Friend and photographer, Jeffrey Dupuis has put together a 2010 calendar that features his photos of musicians, and dates for all of the area’s festivals. Check it out here. It’s not likely that I will often link to ESPN from this blog, but the article linked below is a good read. He seems to get it, although I would get my oysters at Domilisi’s and roast beef at Parkway. Is it finally time for Jazz Fest to change its name? Ok, people in other countries are starting to make fun of us for calling our big springtime music event Jazz Fest, and citing Pearl Jam as the big news headliner. I used to defend the name as tradition, and offer that they did in fact program some jazz. They do still program some jazz, and they’ll probably get a chunk of money out of me to go see Wayne Shorter’s Quartet, although I’d pay a much larger chunk to hear them in a place that isn’t a tent that is 200 yards away from an Allman Brothers concert. I know it would take forever to get locals to call it anything else, but maybe the time has come for the New Orleans Music and Heritage Festival (presented by Shell, or Miller Lite, or whoever). Richard Kamins, Connecticut based culture creature and lover of music, has a new location on the web. You can now read him at http://steptempest.blogspot.com. Richard has always been nice to me in writing, and he continues to do that by including the Jeff Albert Quartet in his 2009 faves list. He puts us in excellent company. We had the pleasure of meeting and hanging with Richard when the JAQ played Middletown, CT last summer. In addition to having excellent taste, he is a nice guy and a cool hang. Read his stuff. …I thought it might be nice to share a bit of information about some of the musical communities that I’ve been exposed to over the past 10 years. And in particular, to highlight those European composers, who emerged after 1970, whose work has helped me to think about both composition and improvisation in new ways. The post is presented in the usual d:o style with great audio samples. It is a nice read, and listen. On an unrelated note, the Lucky 7s Pluto Junkyard got a nice nod from Matt Merewitz in his “Top 10 of 2009.” Matt’s list also includes records by Lucky 7s colleagues Josh Berman, and Jason Adasiewicz. This was one of the stream of odd links that popped up in my Twitter stream today. I don’t know if it would be more or less surreal if I understood Japanese. Can the question be the answer? I must admit that I am a bit jealous of Larry Ochs, who has been investigated by Spanish Police for playing music that was not in fact jazz. I am sure people have said it behind my back before, but no one has ever called the the jazz police, or the real police, because I wasn’t “jazz” enough. Check out Neil Tesser’s nice take on it here, and the story from The Guardian here.